At Glosford SIPS we advocate Modern Methods of Construction and the government’s requirement for the Code for Sustainable Homes is the benchmark for our operations. 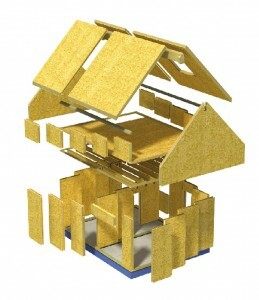 In August 2009 Glosford became an approved partner of Kingspan, and adopted the TEK building System, which is based upon Structural Insulated Panels (SIPs) The 142mm panel is made up of 112mm high performance rigid urethane insulation core sandwiched between two layers of 15mm Oriented Strand Board. The panels are joined together using a unique sealed jointing system that minimises the amount of air that can pass through the joints, making your home incredibly airtight in comparison to conventional Timber frame. The design of the panels and principal of the construction method also mean a continuous layer of insulation in your walls and roof. For example a property constructed using the SIP Building System, as little as 4% of the walls and 1% of the roof will be un-insulated. Therefore the overall result being a very energy efficient home, with greatly reduced fuel costs. Mechanical Ventilation and heat recovery Systems; Open windows, extractor fans and window trickle vents can cost you the home owner up to 40% of your heating bills. Wasting heat causing us to burn more fossil fuels than we actually need, contributing to global warming and o zone depletion (the green house effect). MVHR when combined with your engineered SIP Building system, supplied and erected by Glosford Timbers will greatly reduce your buildings heat loss, A complete SIP construction utilising the Panel as the roof provides a air tight envelope where standard methods of heating are not required. A SIP home can be treated differently to a conventional build, MVHR Systems are recommended to maximise the effects achieved by the insulation. A high performance heat exchanger can recover up to 95% of the heat from extracted air, whilst simultaneously transferring this heat to the incoming fresh air. This is done without the security risk of open windows, the use of noisy extractor fans or creating draughts. All in compliance with the current building regulations. Fast Track Building – SIPs is a fast and modern way to build, whether you are using it for a new build, an extension or renovation. The Energy Efficient Home – Rising fuel prices and the threat of global warming is making all of us think more and more about the energy efficiency of our homes. And Sips is a great way to ensure that you stay in charge of your heating. SIPS v The Others – SIPs has significant advantages over other construction methods. Here are just a few. Easier Project Management – If you’re thinking about project managing your own self-build, you’ll find that using sips will make the job much, much easier. Awkward Access Sites – Not every site is blessed with good access, especially in urban areas or if you are extending your existing home. But, because of their lightweight and manoeuvrability SIPs can minimise the disruption to you and the neighbourhood. Extending Your Home – More and more SIPs being used not just for new builds, but also to extend existing homes. It’s not perfect for every project, but if you’re looking at a large or two-storey extension, give it serious thought. How strong are SIPs? – Not sure that a building system that doesn’t use brick or block is up to the job? Be reassured. SIPs withstand hurricanes and earthquakes.